I hope all my friends on the east coast of the US are safe and sound. I've not seen any TV reports yet but the pictures online show some terrible damage. I just received an email from my agent Abby who lives in Brooklyn and works in NYC. She said she can't get in to the city, the subways are under water and the server is down in the office. The good news is that she is safe and dry. I hope everyone in the storm-effected areas stay safe and that there is not too much damage in your homes. Hanno and I are thinking of you. I was all over the place yesterday. Hanno has had a terrible run of luck with his health since that chain saw accident. Now he has cellulitis of the foot and gout in the ankle - same leg, so he's been in a wheelchair these past few days and I've driven him around to hospital and doctor and home again. It takes up so much time, not that there is anything else we can do, but going out and driving around in traffic is the last ting I want to do when I have so much to do here at home. We have visitors coming from Germany at the end of the week. Hanno's neice Martina and her husband Michael, son Jona and another cousin, Sasha, will stay with us. There are great plans to go to Sydney and up north to Longreach and the Whitsundays but it all hinges on one man's foot and ankle at the moment. We're really looking forward to the visit. There'll be a lot of catching up to do as well as many sightseeing drives, I have no doubt. In preparation for the visit, I'm turning my badly neglected ironing room, formerly Shane's bedroom, into a single guest room. The evidence that I am no saint is above in picture form. As you can see, I'm far from perfect, but that's okay, I know my flaws and accept them. 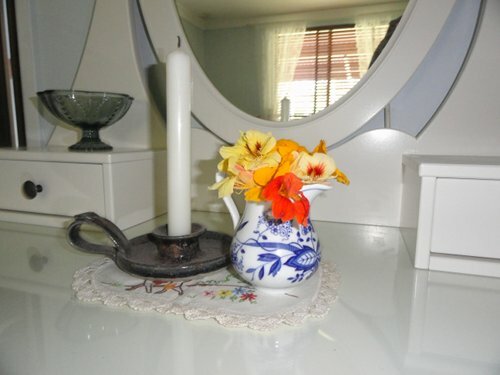 Hopefully, tomorrow, there'll be a photo of a transformed comfortable bedroom suitable for one of our guests. This is the last bit of planting we did a couple of weeks back. My day started on time yesterday at 4am when I wrote my blog and then, with the sun creeping up through the clouds, I fed the animals and chickens. The coop needs a good clean out and I'm hoping to get to it on Thursday. Not that the chickens mind at all. They're constantly scratching around in the straw looking for bugs or a stray sunflower seed or piece of corn. 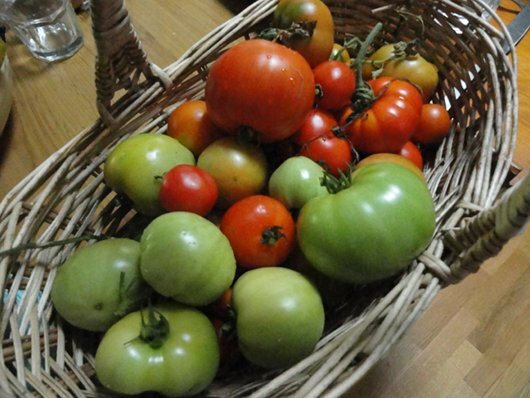 After I filled up their water containers, I watered the vegetables and bush house and collected a small basket of tomatoes. Soon, most of the garden will be laid bare. There are still a few things growing but it's nowhere near what it looked like a few weeks back. It hasn't been a good year in the garden but that may be more to do with us not being here much at the beginning of the season rather than any shortfall in the soil or plants. When I was feeding the chooks, I could hear a constant close buzzing. 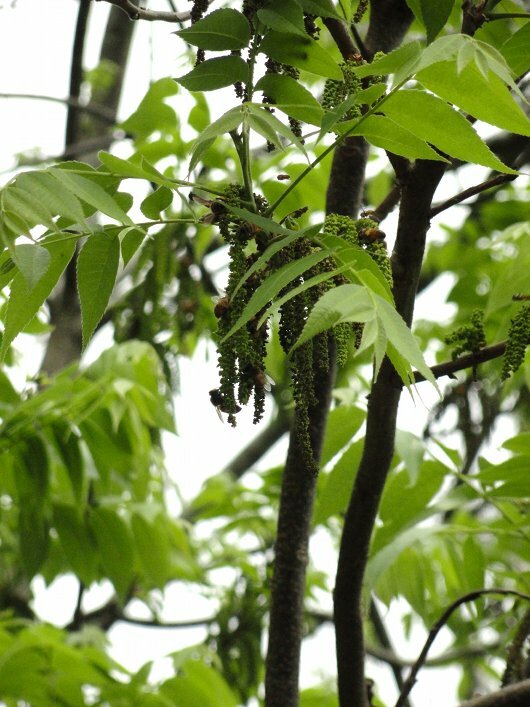 I looked up and noticed the bees flying through the pendulous male catkins on the pecan tree that shades the chicken run. Walking back to take some photos of the garden, I could see the bees swarming around the Queen Anne's Lace flowers too. They were rolling their bodies over the top of the flowers. I almost expected to hear tiny bee laughter. 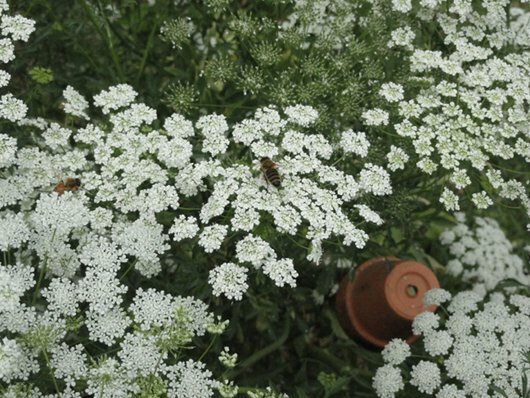 Queen Anne's Lace are ideal flowers to attract beneficial insects into the garden. Along with the bees, wasps, lady beetles, assassin bugs, lacewings and spiders love lace flowers, and all of them are an asset in a biologically diverse garden. Before I went grocery shopping, I did a load of washing and hung that out. Then I was out buying groceries and trying to change my phone and internet bundle to better suit our current needs. We had to buy a new phone a couple of weeks ago and when we did that, the woman in the Telstra shop told us that we could change our bundle after the 28th. Well, that, it seems, was wrong and now I have lodged a complaint and I'm waiting for them to call me back. We've never had a problem with Telstra before so I'm hoping that all this will be sorted out too. 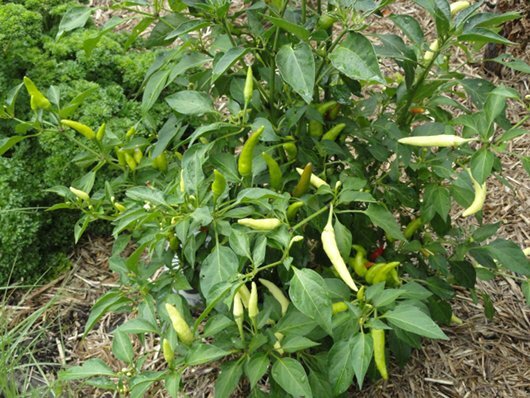 There are a lot of very hot chillies on the bush this year. I'll pick these soon and dry them along with some herbs. While I was down at Caloundra, I decided to shop at Coles. I'm not sure why, curiosity I guess. Never again! I found most of their products overpriced with only one item in the various sections reduced right down. I went down to the cold section and stared at the cheap milk. I think I might have looked a bit demented because no one came to collect any milk while I was there. LOL They had all the cheap and commercial milks in a big section in the middle, then Maleny milk on one side of that, and the other independent Queensland milk at the other end of the store, with the cheese. I guess the independents are happy just to have their milk stocked by a big retailer but I wish there was more support for the independents from the shoppers and more respect for the supply chain from Coles. I won't be lured in their again, it's back to Aldi and the IGA for me. Do you shop at Coles? Back home again, I unpacked all my groceries washed up, tidied the kitchen, fed the animals again, put up some of the new christmas advertising buttons and started this post. Soon I'll get tea on and if I'm lucky I'll watch Time Team without going to sleep. Somehow, I don't like my chances. So, it's morning now and I've seen the devastation in the USA. I didn't watch Time Team because after dinner I had some work to do on the computer, then I went straight to bed at 7.30. I've just spoken to Hanno and his foot and ankle are still red, swollen and painful. We'll have to go back to the doctor again today and see what else can be done for him. It will be another busy day here. I hope your day is productive and enjoyable. Stand by for the updated photo of our guest room, I am determined to finished the room off today and to clean the oven. Take care everyone! If you decide to take the big leap of faith and turn your back on this consumerist society we live in, often you'll produce some of your own food, move towards a local community based economy, or you'll have a combination of the two. If you decide to make a less drastic change and simplify at home while earning a wage at work, your change will probably be governed, to a certain extent, by the amount of time you have when you're at home. Either way, there will be changes, and change is sometimes unsettling. It seems like such a big step at first but as you get used to it, and move into your change, a feeling of calm takes over as you begin to take charge of your life. When you think about it, the consumerist model that we all know so well, takes much more than it gives. It takes away our ability to look after ourselves, unless we have access to money and a shop; it removes us from our traditional skill set - the skills our great grandparents held close and passed on; and it takes away confidence, a sense of purpose and pride in our own productivity. 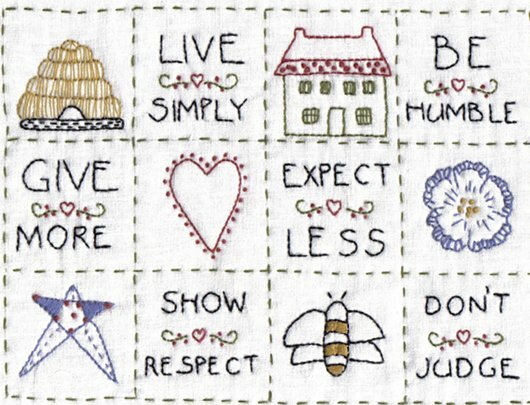 I created this little sampler many years ago. If you want to stitch it yourself, there is a pattern you can print out here. When I first made my change it felt right almost straight away. As the days grew into weeks, then months, I realised that this feeling of calm and comfort came about because the work of simple life and self-reliance is nurturing work. I felt empowered by it. All that organisation, cleaning, fluffing nests, repairing, recycling, cooking, knitting, sewing and gardening - this work brings us together, it supports us and develops our spirit. When I put on my apron in the morning, I think of the work my change has brought me and I smile at the thought of it. This work has helped make me what I am today. Living as we do is a gift and a privilege. To outsiders, what I do might just look like housework, but to me it's a daily decision and ever-evolving process to make the life I want and to create a home I feel comfortable and settled in. This is not passive cleaning and organising. It's a proactive and conscious process. 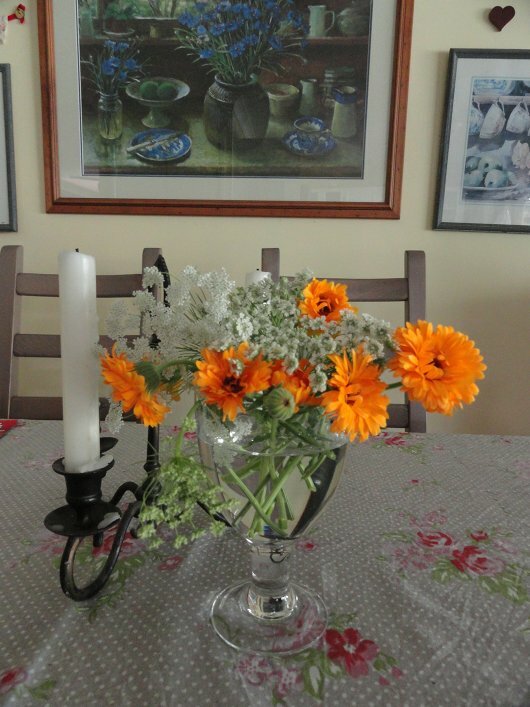 I have taken charge of my home and worked out what I need to do to give us the life we want. It always involves work, if you're lazy, or expect things to be done for you, this is not the life for you. This life requires involvement, intelligence, dedication, patience, generosity and work - lots of hard work. As I work through my day, I think about what I gave up and what I gained because of it. My change shifted my focus from things and money to people and feelings. I went from thinking about making money to looking for ways to save money. If you keep your eye on the prize - the prize being a good relationship with your family and that feeling of constant contentment, this life will give you someone to love, something to do and something to look forward to. You can't go far wrong with that. Our days are fleeting and even if you're in the middle of raising a brood of small children and you wonder when you'll ever get a break, most of what we do lasts such a short time. Slowing down enough to enjoy each day - whether it is spent working in your home, in the garden, with your friends and family or away from home at a paid job. Embrace your work, it will make you stronger. Whether it is home-based or commercial, or a combination of the two, the work you do will equip you for life and enrich you. It might not seem so at the time, but with the benefit of hindsight, you'll see that those hard working days turned you away from some things and towards others, making you a different person in the process. If you're new to all this, step up to it with enthusiasm. Rely on traditional ways but modify them when you have to and do your work your own way. If you have a good day, build on it tomorrow. If you have a bad day, go to bed early, have a good sleep and get up ready to get stuck in again. Every so often, think about all the changes you've made and be mindful of how far you've come. It may not always feel like it but you're building a new life and going against the tide to do it. That not only takes strength and resilience it also builds character and confidence. And if you build your life with all new those values, there will be no stopping you. With Christmas coming I've been thinking of offering a frugal advertising option on my blog. Way back I used to have a few Adsense and Nuffnang ads here but I found them intrusive and ugly, I had almost no choice over the ads shown, so I stopped both, even though they were quite lucrative. Since then I've gone to a fairly unique form of advertising in that I barter space for goods for most of my major sponsors. I only take advertising from small and home businesses that would otherwise find it difficult to reach their desired market because the price of advertising is either too expensive or their appeal is limited in today's marketplace. Here we have a passing traffic of people who buy ethically and mindfully and who want value for money. I think those elements blend together well. On Thursday, I stepped down from my role as secretary of the Maleny Neighbourhood Centre. 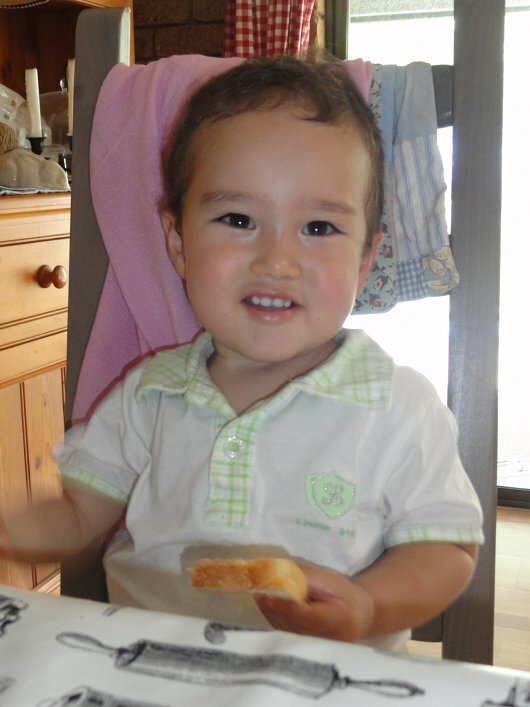 I left as a volunteer when Hanno had his accident. It was a good AGM, with a new group of eager community people to step up and take over. I felt sad to leave but relieved as well. I've been there for six years and have a place in my heart for the Centre that I know will be there until I die. But it's time to do other things and to let new life thrive there, just like I did. I was presented with a gift, and after many hugs and good wishes, I left for the last time, slightly saddened it was over but oh so grateful I had the chance to work there. That placed changed me for the better. 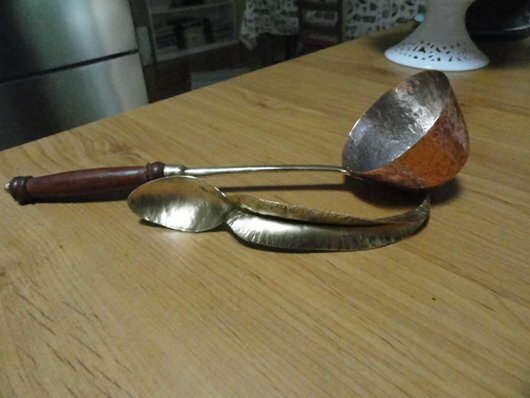 I opened my gift when I came home and found an absolutely beautiful hand-worked copper punch ladle and metal spoon. The spoon handle is the shape of a gum (eucalyptus) leaf. When I looked at the small labels attached, they were by Barry Smith, the president of the Centre! Barry never fails to amaze me. 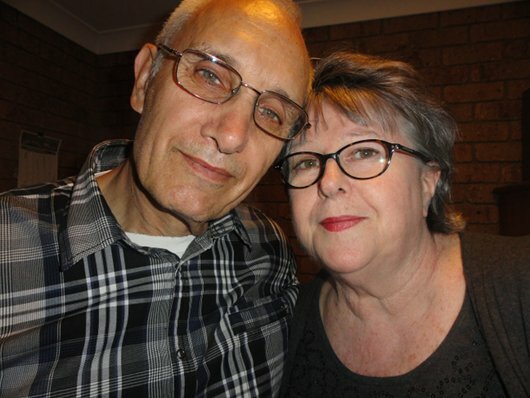 He is an ex-public servant who, with his wife Fiona Dempster, are now artists and have "retired" to Maleny where they work for and in their community and do an ever decreasing amount of consulting work. I checked out Barry's website and it is the reason I'm writing this post. He has a shop there with the most wonderful handmade objects for sale at VERY good prices. Too good. If you're looking for an original and beautiful gift for someone this Christmas, I can recommend Barry and his work to you. It's textural and exquisite and the first time I picked up my ladle, it felt like the cover of my book. I'm so pleased I know about his shop because when I buy gifts now, I like them to be unique and worth buying. 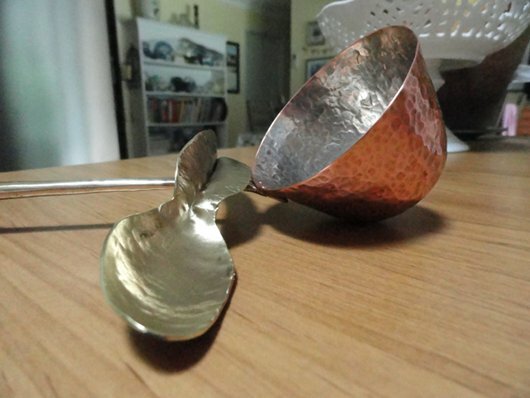 Barry is using recycled materials in the most beautiful way - I particularly like Daily Words 4 and Simple Silver Bowl and I know two people who would love them. Have a look and see what you think. I have just signed a petition at change.org asking that Coles increase the price of their generic milk so that dairy farmers get a fair price for their milk. I hope you'll join me because dairy farmers are walking off their farms and if that continues, not only will there be no cheap milk, there will be no fresh milk. 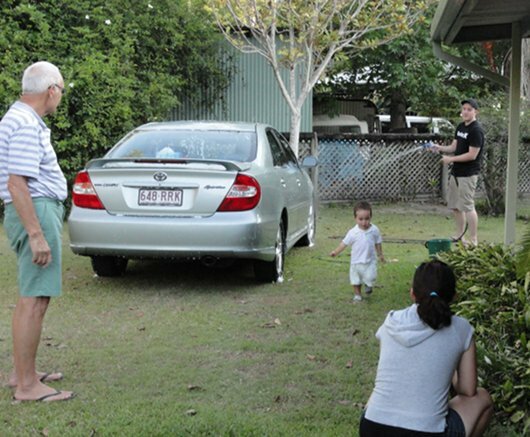 Since Coles began selling cheap milk in 2011, 45 Queensland dairy farmers have closed their businesses. I wonder what is happening in the other states. We do not want to import milk. There is still a huge need for signatures - only 1400 have signed and we need 10,000. This is important, it will take you one minute to sign, you don't have to have your signature displayed publically if you don't want that. If you're living in Australia, please sign ... click here. If you have a blog, I urge you to put this link up so your readers can sign too. Tell your friends and family, the people at the club, at school, at work. This is important for every Australian. 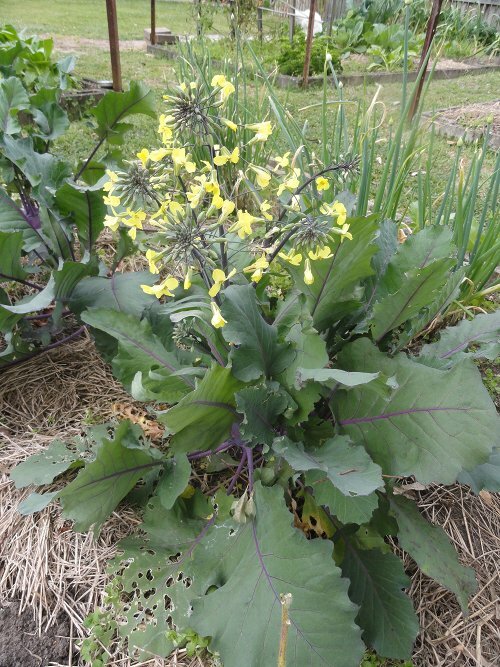 Earthwise Gardening Blog - if you're a gardener, you'll love this blog. Written by the wonderful people at Green Harvest, this blog is spot on with accurate and interesting plant and seed information. 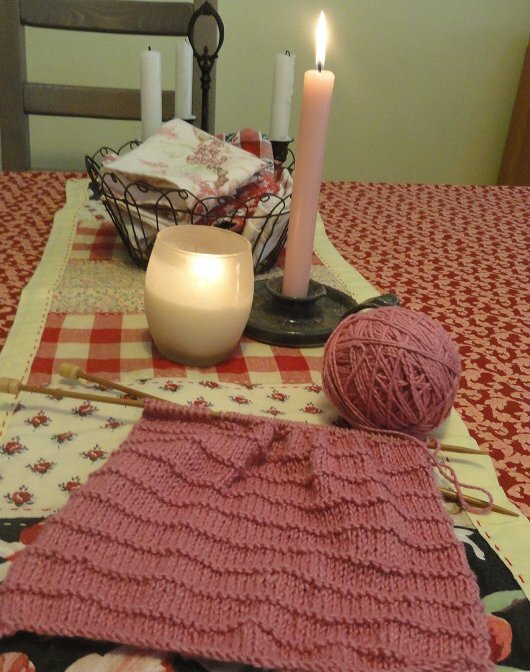 Knitting and crochet at Knot Garden. She isn't posting now but there is a wealth of beautiful projects there. Read all about the life of The Barefoot Crofter on the Western Isles of Scotland. There is a wonderful giveaway prize of Amish dolls clothes and a book here. Hurry, it closes today. I've had an unusually large number of people ask me what I've been reading lately. Well, apart from the obvious, in the past two months I've finished The Contented Chook, The New Home Larder, and Annie's Garden to Table, this last book was sent to me by the lovely Anne (calico ann) at the D2E forum. I'm now reading A Year of Slow Food. There was a time, pre-babies, when I read about three books a week. Now I read a book a month and sometimes not even that. I'm always going back to my core group of books though. 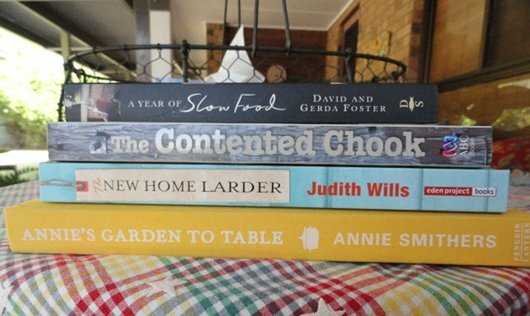 These include The Complete Book of Self Sufficiency by John Seymour, Nourishing Traditions by Sally Fallon, Wild Fermentation by Sandor Ellix Katz, The Thrifty Kitchen by Suzanne Gbbs and Kate Gibbs and Real Food by Matthew Evans. 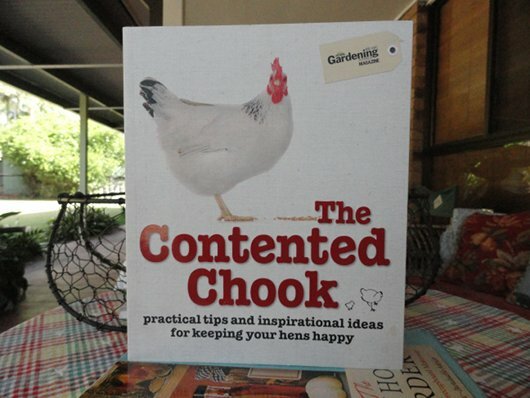 The Contented Chook is an ABC book published by Harper Collins. This was sent to us by a lovely man, Ted Dobbs, who we met in Toowoomba. Ted owns the Dymocks book shop there and originally asked me to take my pick of books in his store, then posted this book out to Hanno. Thanks again Ted! It started out as a feature in Gardening Australia magazine when they had a feature asking readers to send in photos of their chook houses. There are about 60 photos of chook houses around the nation but also a good guide to the various chook breeds available in Australia, and much more. The section on looking after your chooks is excellent. 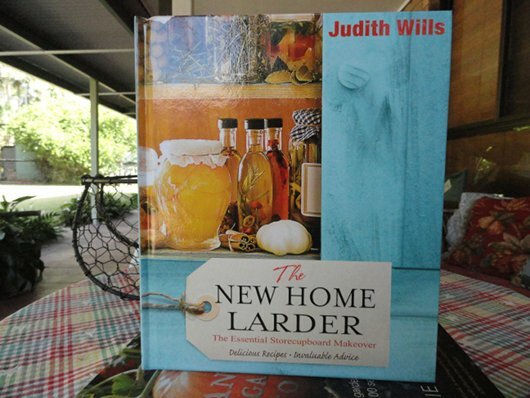 The New Home Larder by New Eden Books is a British book in two parts. Part one is how to stock and maintain a larder and part two is all recipes. It would be a good book for a young homemaker but I didn't find much in there that was new. 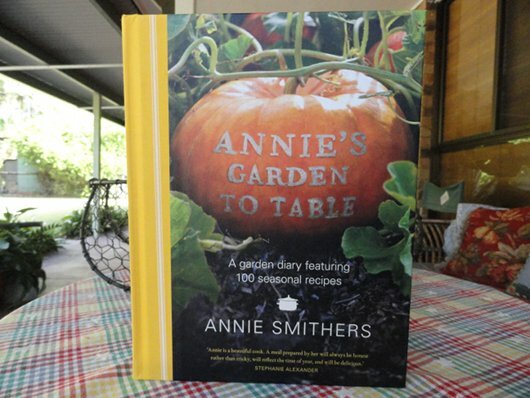 Annie's Garden to Table by Annie Smithers is an Australian book published by Lantern, an inprint of Penguin. Annie is a women who has worked as a chef and transferred that knowledge and passion to her own farm. It's a seasonal book, going through a series of recipes month by month. I don't think seasonal books work well in Australia because our country is so big, there is no one size fits all here. Nevertheless, I did enjoy this book a lot. It highlights the importance of fresh local food and quality ingredients. The recipes and writing are good and there are delightful diary entries such as 31 May ~ Finding pleasure in patience. 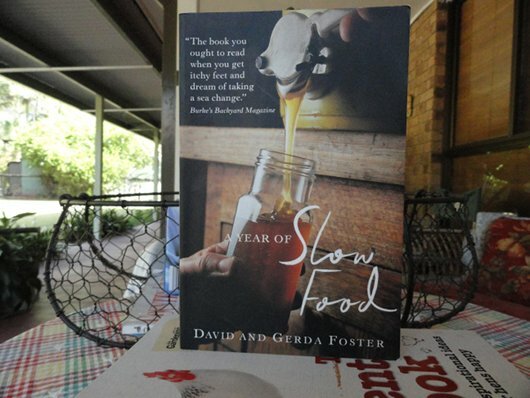 My last book, the one I'm about to start, is A Year of Slow Food by David and Gerda Foster. This is an old book, published by Duffy and Snellgrove in 2001. It was sent to me by my good friend Kathleen who has just finished reading it. She loved it so I'm looking forward to it very much. 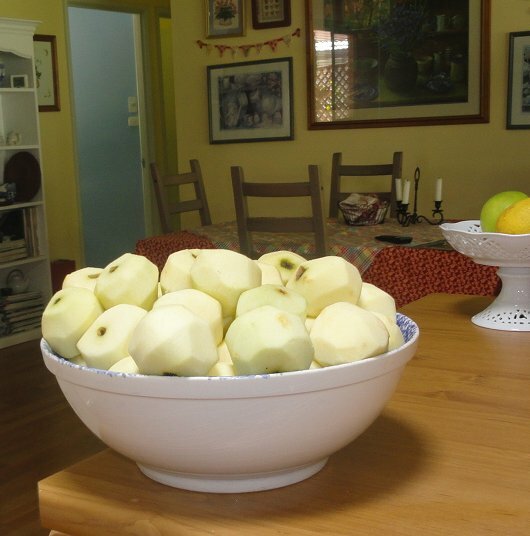 It's the story of a family with eight children who, 25 years ago, moved to the Southern Highlands of New South Wales to become productive and self reliant. They taught themselves to milk cows and grow enough food to feed themselves - all while renovating a derelict house to live in. It sounds like my kind of book and I'm looking forward to reading it. What have you read lately that you recommend? I've had a couple of requests to write about ongoing changes as you age and get ready for retirement. Hopefully, by the time you're in your mid-to late fifties, your children will have packed their things and moved out to start their own lives. This is one of the things you've worked towards for many years - not for them to leave but to see them set up their own home, maybe with someone they love, or a couple of friends. At this stage, you hope that all you've given your children - the love, time, effort, advice and guidance will allow them to spread their wings and find success and happiness on their own. When that happens, you go back to being a couple again, or maybe a single person. Either way, you'll have a lot more freedom. You'll probably have more money too. The key to this stage of life is to have all your debt paid off because you want to be at that stage before you retire. If you do find you have more money and you still have debt to pay, put all that extra money towards your debt. Make sure you're paying your mortgage fortnightly instead of monthly, continue to live frugally and use all your spare cash to pay off your mortgage as soon as you can. It might be a good idea to talk to your bank to make sure you're on target with the mortgage and to find out exactly how long it will be before you pay that last payment. While you're in that frame of mind, check your superannuation fund (401K/retirement fund) to see what money will be available to you when you retire. Even though you've got another ten years before that happens, it's best to know now if there will be less than you expect so you have a chance to make adjustments if you need to. Work out for yourself how much you need each year to live and multiply that by 20 and that will give you an approximate amount. In most countries men live to their late 70s and women to their mid 80s but no one knows how long they'll live - there is a fair bit of guess work needed so most people go by the average age lived. If you know you'll have to live on a government pension, research that so you know what to expect. On the practical side, now is a good time to take a fresh look at your home. Will this house suit you when you're 20 or 30 years older? If you have to move, it's best to do that after the kids have left home and while you still have some capacity to earn. Think how you might be in the future, you need your home to support your needs, not hinder them. You might need to move if your home has a lot of stairs, if you're in a built up area and you want a quieter place, if it's too big for you with the children gone, or if you've lost your partner and the memories are difficult. If you do move, look to a smaller home, maybe with two bedrooms, and a smaller yard. 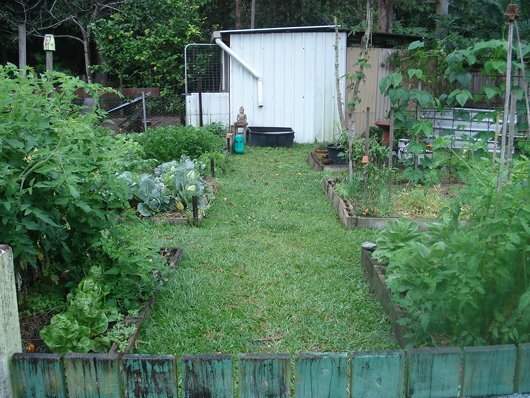 You might want to grow your own vegetables or have a flower garden and chooks. If you're lucky, the sale of a larger home to move to a smaller one, might wipe out your mortgage. Look around with that in mind. Now is not the time to upscale or go upmarket. Choose what you know you'll need and be happy with that. Financial freedom might be just around the corner and if it is, you'll soon see the benefits of a smaller home. If you're renting, ask if the future is reasonably secure. Again, if you think you might have to move, it's best to do it when you have the energy for it and possibly just before you retire. Decluttering will also be on your agenda. It's an idea time to do this when the kids leave home because you'll be able to pass on a lot of your family treasures. 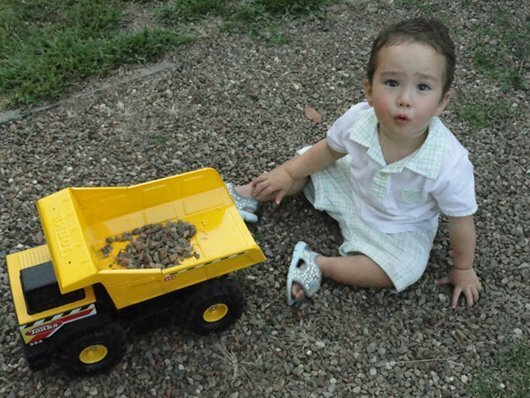 It will give you the space you need and it will give your children a good start in their first home while keeping the heirlooms in the family. When you're sure you're in the home you will live in forever, do an audit of the house and yard. What needs fixing - now, in five years time and in ten years? You may need to install some extra handrails or make sure the steps are completely non-slip. 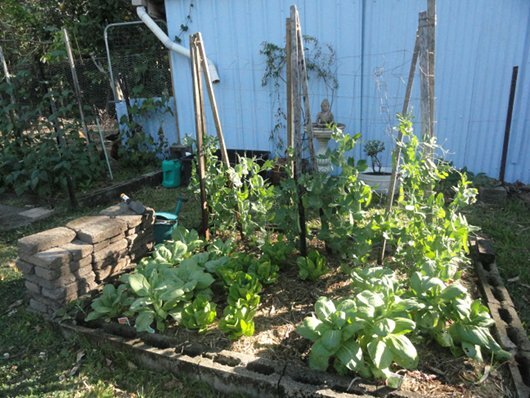 If you want to grow vegetables and keep chickens when you retire, think about that now. Think of all the ways you can save money in your home when you have more time to do it. Will you need fences? Hanno and I have found that fences of various styles and lengths have been a feature of our backyard since we moved here 15 years ago. 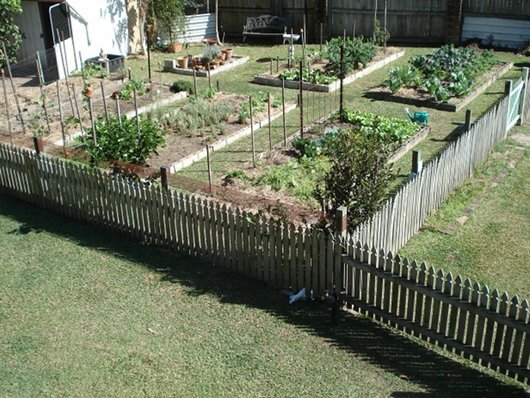 Sometimes we had dogs, always chooks, we now have grandkids and fences have helped us keep then all away from the garden. 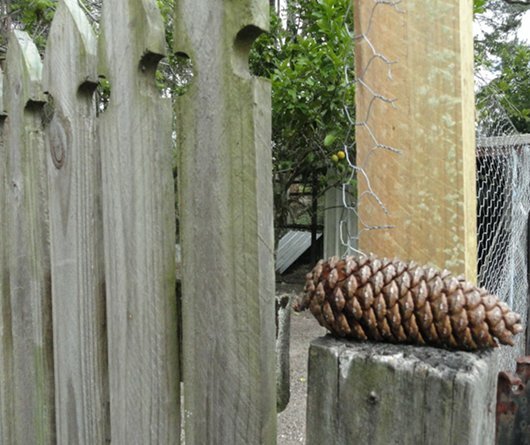 We moved our fences when the dogs died, re-fenced again when we had grandkids. Do you want to have a potting shed/green house? It's time to do all that work, and the fencing, in your fifties. It was my experience and that of a few friends of mine that we lost our strength between 55 and 60. Do all the work that will set you up later in life when you have the strength for it. 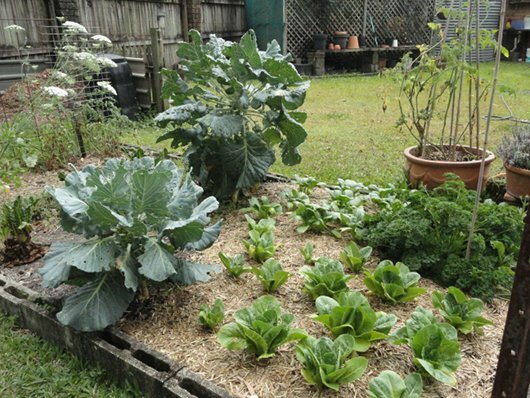 If you want to start a new hobby, raise a garden or chooks, now is the time to start researching and teaching yourself everything you can about it. There will be more learning along the way, but at least get a start on it now. Once you know more about one of your choices, it may not seem as sensible as it did before. 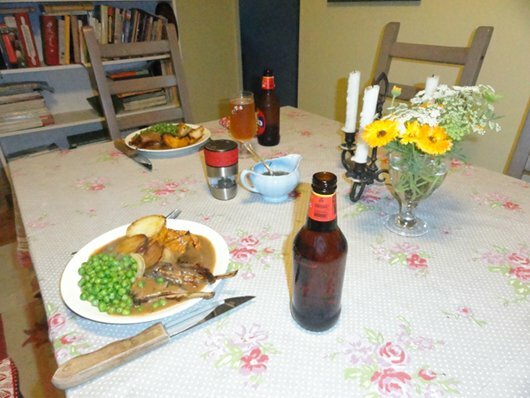 When the kids leave home, learn to cook for two, or one. This will impact on your shopping and how you store food as well. Make sure you still eat healthy food and make the time to cook - you are worth it. Look at your appliances - if you still have the same fridge or washing machine you had 20 or 30 years ago, now is the time to replace it. The new appliances use electricity much more efficiently than the old ones did so you might replace your fridge or stove now and notice a decrease in electricity usage. You might find you want to get rid of a few appliances you no longer need - such as the dishwasher, clothes dryer, microwave. If you can afford it, install solar panels - it's a sizeable expense but it will pay off in the coming years. Make sure you maintain your friendships and keep your family close over the years. Retirement is the time you will rely on them much more than in the past. And when you do retire maintain your internet activities and enjoy your online communities, but make sure you enjoy the outernet too. That is where life happens. It's quiet here. We hear the general noise of most small neighbourhoods, like an occasional car driving by, lawn mowers and sometimes a dog barking, but most of the time it's birds or wind or just silence. Late in the afternoon, especially around this time of year, flocks of ducks and magpie geese fly overhead. At the moment, willy wagtails are swishing over the grass, competing with the chooks for insects and the spangled drongos are here to rest on their annual migration to New Guinea. It's been a slow and gentle day. I've done some writing, baked a cake, vacuumed and washed the floors and then there is the sound of a car driving in and look who walks through the door. It's Jamie! It is amazing to me how quickly the feeling of a home changes as soon as children are about. Soon there are snacks to make. Opa is here! We can play you push my car. And there is so much to do outside. 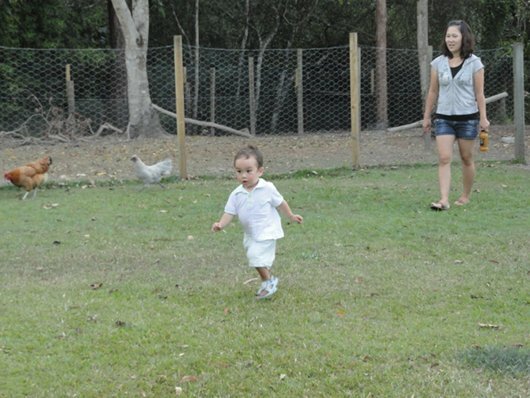 There are chooks to chase and so much grass to run on. But I still help Opa collect the eggs. And I have to help daddy wash the car so I'll zoom around like a jet so he can't splash me with that hose. 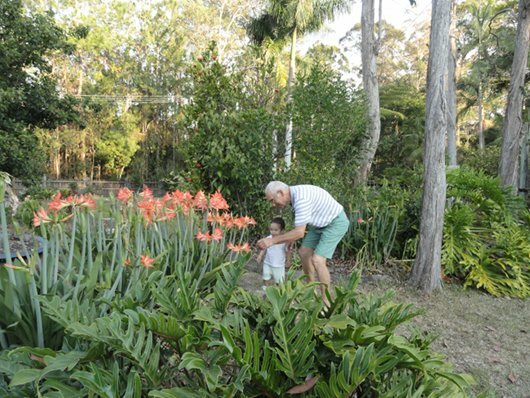 Opa and I walk in the garden and talk about the flowers. What's that grandma, it's time for tea? I'll just put these on and she won't recognise me. 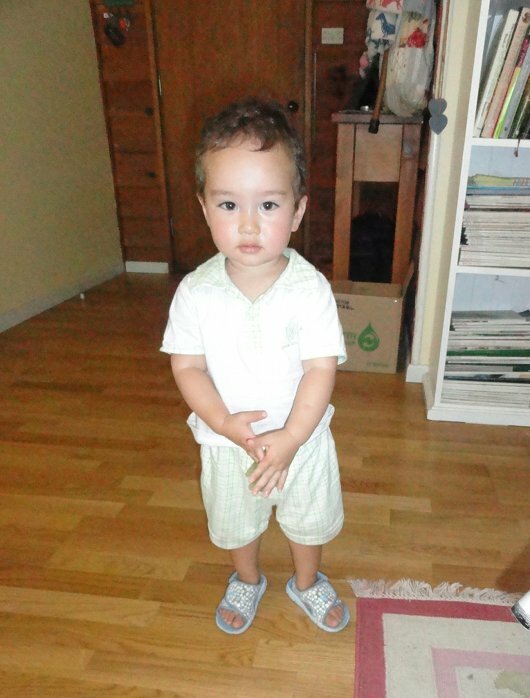 He's is growing up so fast, but I said that about his father too and I guess my mum said it about me. Soon we'll get to see much more of Kerry, Sunny and Jamie because at the end of the year, they'll move up the coast to be closer to us. We're looking forward to that and to being able to help care for Jamie while Kerry and Sunny work. It's 5.30am and I can hear Jamie waking. 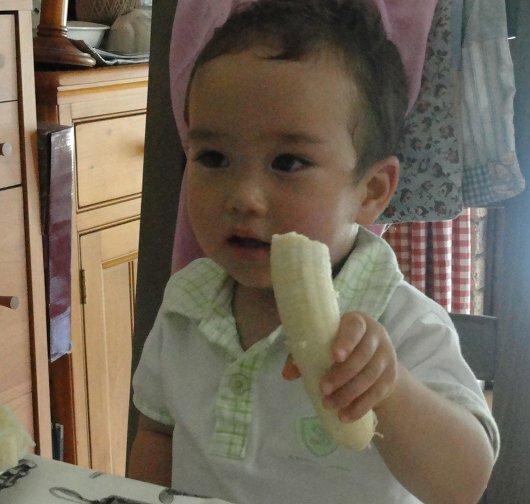 He's talking to Sunny. Soon they'll be up, breakfast will be on the table and the day will begin with a child in the house. I hope you enjoy your day. I am getting more and more interested in preserving. I've always done a bit, jams and such, as well as drying tomatoes and apples, but this year, thanks to your blog and the forum, I've been making salsa and pickles, using just vinegar, sugar and/or salt to preserve. I don't have a water bath kit but read on the forum today that the water bath is the only way to preserve vegetables. I hope to do much more preserving of vegetables this year so I wonder if you could either advise me, or perhaps write on your blog, if it's necessary to preserve vegetables that way. A water bath is one of many ways to preserve food. You can use salt, sugar or vinegar to preserve food and you can dry it. Most bacteria need moisture to survive, if you remove it, by drying the food, bacteria can't grow. Traditionally meat and fish have been dried to keep it going over long winters when people were unable to hunt due to the weather. There are instructions here on how to dry meat, fish and chicken, and here. You can pressure can meat and fish but you can't water bath it. You can also smoke meat, fish and chicken although this is similar to drying, it also adds its own unique flavour. And for those who like to make things, here are instructions on how to make a smoker using a steel barrel. If you're going to do a lot of preserving, it's wise to find a good modern book on the subject. You need to follow specific instructions using the correct processing times or amounts of vinegar and/or sugar for all your jars to be safely stored. In Australia you can use either British or Australian books, if you're in the USA or Canada, use local books - we do it differently here and in the UK. 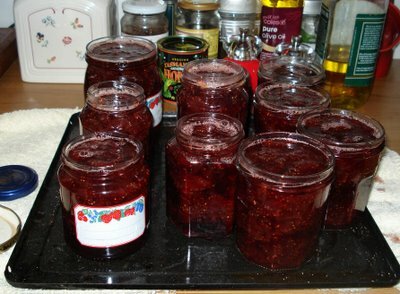 I rarely use my water bath if I'm making jam, relish or chutney and I like the River Cottage Handbook No 2 for recipes. 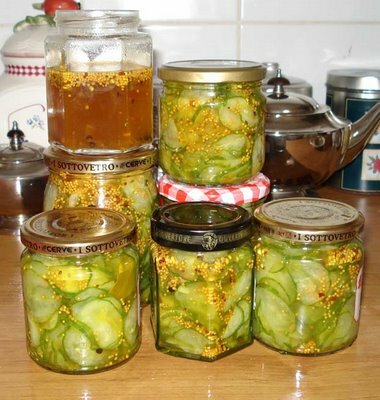 If you're looking to preserve vegetables, you can pressure can almost anything - that preserves food by sterilising it. If you're using a water bath, which never reaches the high temperatures of a pressure canner, you'll have to use only high acid vegetables, such as tomatoes, or fruits or vegetables with vinegar and/or sugar added. Again, read about doing this before you start; you have to have a good understanding of it before diving in. You can also add flavour while preserving by making chutneys, relish, jams and sauces. Again each item you make has to have enough sugar or vinegar in it to act as a preservative if you intend to not water bath at the end. You follow a recognised recipe to know how much vinegar or sugar to add. Sugar and vinegar act as a preservative because bacteria cannot grow in that environment. If you make sauces, jams, relish etc, you must make sure they are added to hot, sterile jars with sterile lids, as soon as they've finished boiling on the stove. This gives the sauce, jam etc, a bacteria-free environment, and the sugar and vinegar added to the recipe, along with the boiling, will help preserve it. Wine is one way to preserve a summer harvest of grapes and you can preserve lemons, oranges, passionfruit, pineapple juice as cordials that will keep because of the added sugar content. There is also the age old and various techniques of fermenting a huge range of foods. Sauerkraut and kimchee are the German and Korean traditional ways of preserving cabbage. See here for instructions on how to make them. If you're looking for good books on fermenting, I like Wild Fermentation and Nourishing Traditions. Here is the Wild Fermentation recipe for sauerkraut. Fruit and vegetables can both be dried for preserving using a dehydrator, slow oven or microwave, or out in the sun under wire gauze to keep the insects off. Click here for an article on how to dry vegetables without a dehydrator. Cheese is so commonplace now we rarely think of it as a way of preserving milk. With the addition of beneficial bacteria, the removal of the fluid part of the milk and sometimes the addition of salt to the outside of the cheese, it can sit in a cool room for many months, developing flavour. Milk can be made into kefir or yoghurt and both can be made into cheese. See instructions for kefir here and kefir cheese here. I wrote this post a while back about processing food in a water bath using equipment you've probably already got in your kitchen. If you want to try this method of food storage, it may be a good idea to test your skills and methods this way first and if you choose to, you can buy a water bath unit later on. 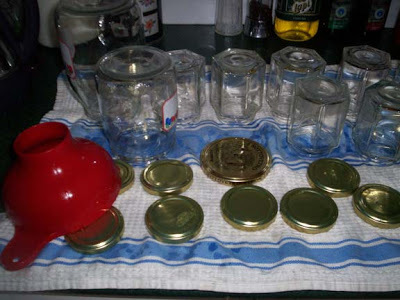 How do you go about storing small amounts of food or preserving vegetables without a water bath? It's been a busy week here with Hanno able to drive again and the first workshops behind us now. 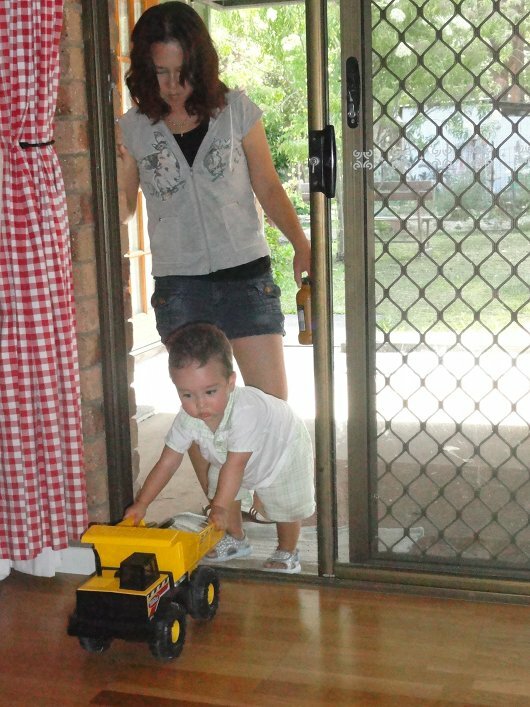 The newest member of our family, Johnathan, came home from hospital with his mum and dad, Laura and Danny. He's a happy and contented baby who sleeps well - surely a joy for most parents. I'm running a bit late today after a couple of hectic days. I hope all is well in your neck of the woods. One of the reasons we decided to settle in the area we live in is for the sheer beauty of this place. We are about a 15 minute drive from the coast and at the base of a mountain range called the Blackall Ranges. On the rolling green hills there are a few cottages, farms and towns in between the Bunya pines and pockets of rainforest. Part of the beauty for me are those rolling hills on which contended cows graze and if I lived here for another hundred years, I would never tire of seeing them. They've had Guernsey cows at Maleny Dairies since 1948. I've written about my local dairy before, I'm a staunch supporter of their products simply because their milk is the best I've ever tasted. But I also think they're a very important part of the local business community, they employ over 60 local people, they're focused on sustainable agriculture and after building their own processing plant several years ago, they now process milk from six other local dairy families. Maleny Dairies is a third generation family business and very keen to keep their family tradition going into the next generation; with sales increasing, the future looks promising. We pay a bit more for Maleny milk but I'm happy to do that because we're getting the very best product for our money. There is no watery milk or strange tastes. This milk does vary in taste, but they are seasonal changes, the changes you would expect in a fresh natural product. Sometimes there is more cream sometimes the milk tastes richer, but despite the variations, it's always delicious. I've discovered something wonderful at the Maleny Dairies site. They have a cow cam! Click here to go there. Sometimes it just looks out over the paddocks with the sun shining, sometimes you'll see people and cows. If you're coming to Maleny, it's well worth a visit to the dairy for a look around. 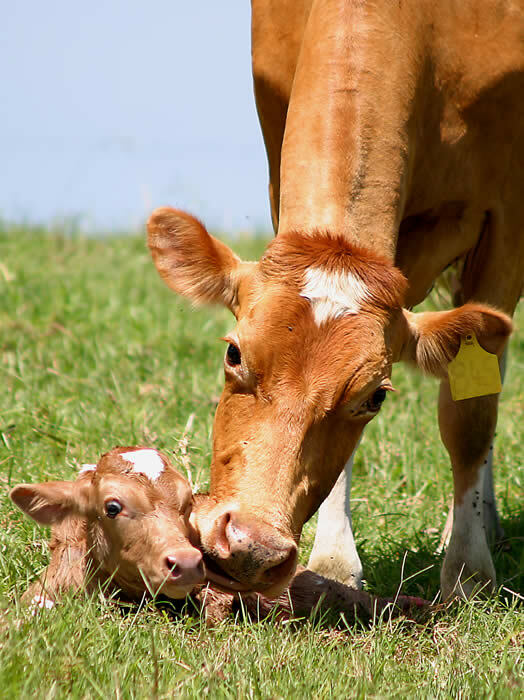 If you have small children, it will give them the chance to see cows in their natural setting and taste real milk. I think the days of cheap at any cost are over. I hope they are. We don't want to pay more than what is a fair price for any product, but we should pay enough so that every part of the chain that produces what you buy receives a fair share. Often, that doesn't happen. Do you have a local business or industry that you choose to support despite it costing a bit more? I think we all have drawers where we throw in junk that we don't want sitting on the counter top. 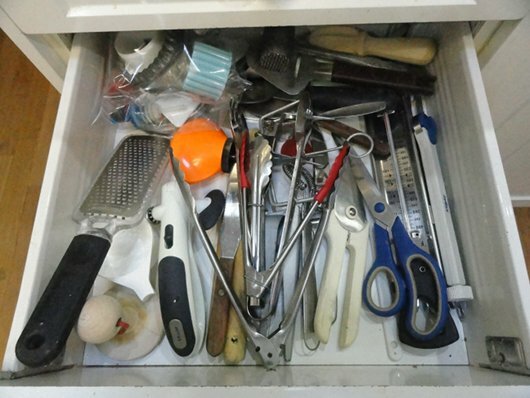 My junk drawer is in the kitchen, just below the cutlery drawer. It holds kitchen utensils I use almost every day but also junk that should be recycled or thrown out. This drawer hasn't been cleaned out properly for, I'm ashamed to say, years. But now it's done. It's not at the stage I want it at yet, I asked Hanno to make some dividers for me when he's well enough to do it but he said we're better off buying the same metal baskets we have holding our knives and forks (see first photo below). Next time I'm in town I'll get some. We bought them at Howards Storage. I removed everything from the drawer. Slipped the drawer out of the runner and cleaned it throughly over the sink., then dried it. The drawer as it is now. It doesn't look much better but it's not the final state. It will have to do until I buy some wire baskets to hold the different categories of items. I've got all my cookie cutters and things I don't use so much along the top and the frequently used things below. So now I've done my drawer, I challenge you to do yours too. This took about 10 minutes. It was an easy and quick job and I wonder why it took me so long to get around to it. I'm going to start a thread over at the forum this morning to hold all our before and after photos. Come on now, don't be shy. Get that camera out and let's see how many of these drawers we can clean up today. 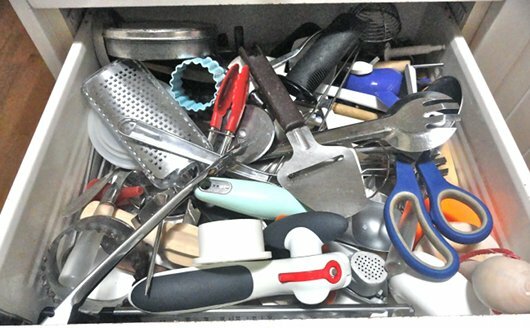 BTW, it can be any kind of junk drawer - it doesn't have to be in the kitchen. We can have a bit of fun with these little jobs by doing them together. So, let's get a move on. Here is the link to the forum post about the challenge and where you can show your own before and after photos. Please note, you have to be a member of the forum to view the link. If you're not a member, you can sign up by clicking the link at the top of the page. Membership is free. When I was 17 or 18 and started going into the city to have fun with my friends, I clearly remember my mother lying awake waiting for me to come home. She would say: I can smell smoke, have you been smoking? No mum. I was in a room where people were smoking. Where have you been? King's Cross/Darlinghurst/the city/a party. Then she would tell me every time: They will cut your throat for nothing there. They charge you sixpence everywhere else. It was her attempt to gently warn me of the dangers lurking in the Sydney of my youth. You all know my age. I'll be 65 next April so I'm talking about the mid to late 1960s. Sydney was different then. I felt safe wandering around at night and coming home late on the train; most women did. I would never do it now. I progressed through my childhood and teenage years without knowing anyone who was a victim of violent crime. There were no break-ins where we lived and we didn't hear of any gangs except "crime gangs", sometimes we read in the newspaper about a murder. I'm not going to white-wash those times, I don't have my head in the sand, there were violent crimes happening then. Two I remember were the Graham Thorne kidnapping and murder and the girls who were killed at Wanda beach. I remember them to this day because it was unusual for children to be killed then. Men would kill each other, men sometimes killed their wives, but kids? No, they were, for the most part, out of the scope of random and senseless killings. Just this past weekend, two boys on the Gold Coast were robbed of their skateboards and one had his throat slashed. Close to my home, two alpacas were bludgeoned to death with an iron bar. Just recently a young woman walking home from a club in Melbourne was abducted, raped and murdered. I could go on and cite more cases of violence and a quick look in your local newspaper might reveal a similar situation where you live. I guess you're wondering why on earth I'm writing about this. I believe we are all partly to blame for the violent times we live in now. I know I shoulder some of the blame, not because I took part in it, but because I didn't stand up before now and say something. I think we all should do that. We, as a society, have stood by while more people were murdered, more children abused, more women raped. I have complained about it to friends and family but I have never said anything to my local member of parliament and I've never written about my concerns publicly. Civility, respect and responsibility need to be a big part of what we teach our children, and more importantly, what we model for them. Grace seems to have disappeared from our lives and we need her to return. We're desensitising our children by allowing them to "entertain" themselves with violent computer games. I think we have desensitised ourselves into believing, for the sake of convenience, they do no real harm. I have no doubt that the daily happenings we are surrounded by - TV news and the continuous reports of violent crimes, computer games, the bullying and hatred on Facebook and Twitter, are making us believe that crimes of violence, and computer games that reflect them, are inevitable and it's just how things are now. And yes, it is how things are now but it has descended to this in my lifetime. I hope we can get back to a more civilised society before I die because I don't want my family to live like this and I don't want yours to either. I remember writing about how Hanno and I bought chooks for our boys when they were young - chooks were their first pets. 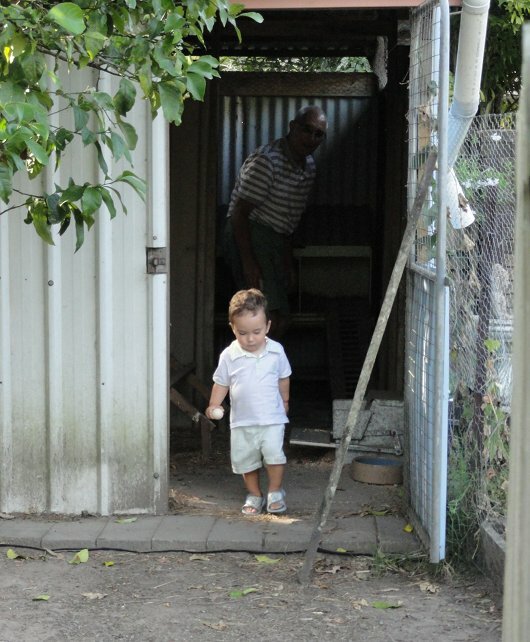 We used the chickens to teach our sons gentleness, responsibility, respect and trust. Those chickens helped them incorporate common sense into their daily lives and build self-confidence. I thought then that girls did not have to be taught how to be gentle; I thought it was part of a girl's nature. Sadly, I don't believe that now. I look at some girls and women around me and they're as tough and brutal as some of the men. This is a problem that effects all of us; it's not just about children, violence, abuse or cruelty. We have to stop living as if it doesn't matter that this is now "normal". Like almost everything, it has to start with us. We are the only ones we can change, we have to step up and be better roles models - all the time, not just when it suits us. But we also have to talk to our politicians and the media, and blog about it, to get the message across that this is a major problem. We have to talk to our friends and neighbours about it and give it a much higher profile. We have to show that we want change and that we've stopped ignoring the problem and accepting it as part of how we live now. Diann at Diann's Domaine is a busy grandmother and a talented craftswoman. Thank you for visiting me this week. I'm looking forward to a visit from Sarndra and Alex today. They're staying overnight before driving up to their new home in Gladstone. Shane is going ahead with a truck full of their furniture. It's a fine line we walk sometimes - that line between having enough and having too much. One of the things that confuses many of us when we come to this way of life is this question: what can I use that will help me with my work and what it too much? You would have to look back a long way to find women who commonly did the work many of us do now. I guess it would have to be pre-1950 because from then on, new appliances made a big impact on our society. So when you think about it, pre-1940s women usually worked full-time in the home, and generally they had large families. 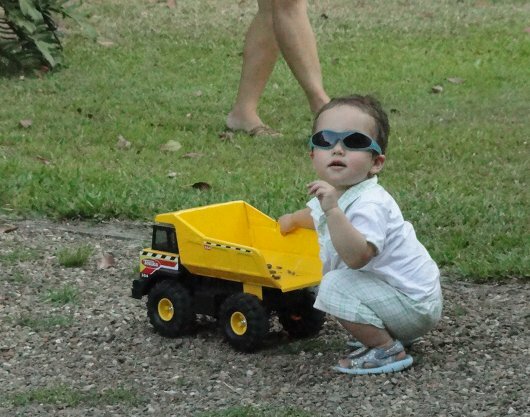 Large families = a few helpers. But what if you're a single person, a couple, a small family or a larger family with children who are busy studying or working, or refuse to help in the home? How can you still carry out the work many of us do? You buy the equipment and appliances to help to do what you need to do. Now let me get this out quickly before there's a riot here: I hate having to buy new equipment when I already have something that can be modified or will do a good-enough job. But I also see the wise economy and the good sense of buying quality appliances and equipment that will help you live the life you want to live doing the increased amount of work many of us do. For example, I don't think you need a dish washer, but I think you need a washing machine. You don't need a dryer if you're living in a good climate but you might have to buy a clothes line and clothes racks for good and bad weather. We have an outdoor clothes line as well as one under cover that Hanno made using recycled materials. So what do you need? These are my choices, my guess is that there will be different opinions about what is useful and what isn't based on family size and whether the homemaker also works outside the home. With everything you buy, buy the best quality you can afford. It is not a bargain if you have to replace it every second year. Solar panels - we have the smallest size - 1.6kW and since they were installed in April last year, we have not paid a single electricity bill. We are very thrifty with the power switches here but if you're on the grid and you use electricity, I think it's a good investment to have solar panels, even if it's only the smallest size. Washing machine - we have a front loader and have had a front loader for the past 25 years. They're easy, economical and very efficient with water, electricity and soap/detergent usage. 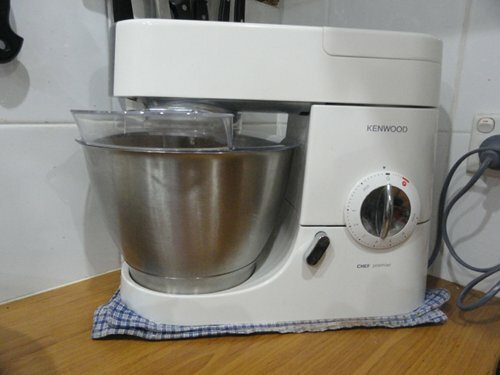 Electric mixer - Hanno bought me a Kenwood Chef last Christmas and I've used it every week since. 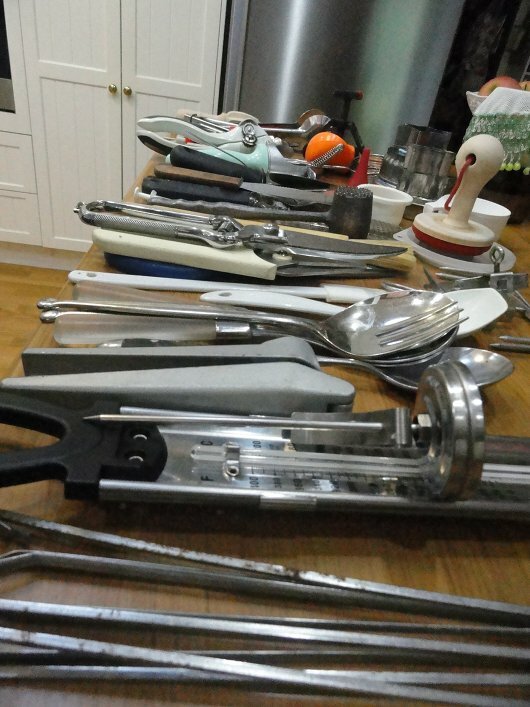 It has a meat mincer attachment and several different beaters, whisks and paddles. Stick blender - I use mine for making soap and, after a good wash, for various jobs in the kitchen. Bread maker - I use mine to knead the dough but not for baking. 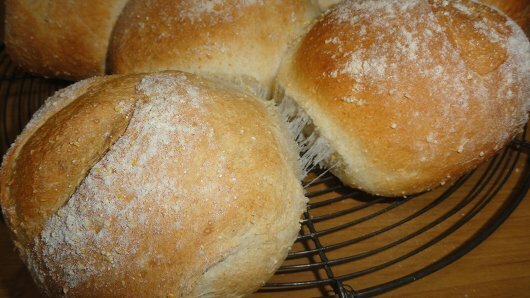 Those of you who make bread by hand every day will know that the kneading takes only ten minutes, but when I was busy, having to put aside ten minutes every day for fresh bread just sent me to the bakery instead of making my own. I want to make my own bread because I want to know what's in the food I eat. It's also a cost saver. A nutritious loaf of bread at the bakery costs around five dollars. My loaves are a fraction of that, I know what's in them and I can modify the size of them according to who is here. The bread maker is the one thing many people have a problem with, I've heard it so many times. Some homemakers seem to think it is "cheating", that the bread is somehow not quite right if it's made in a bread maker. It's just an appliance like the others. Is it cheating to use a washing machine to clean your clothes? 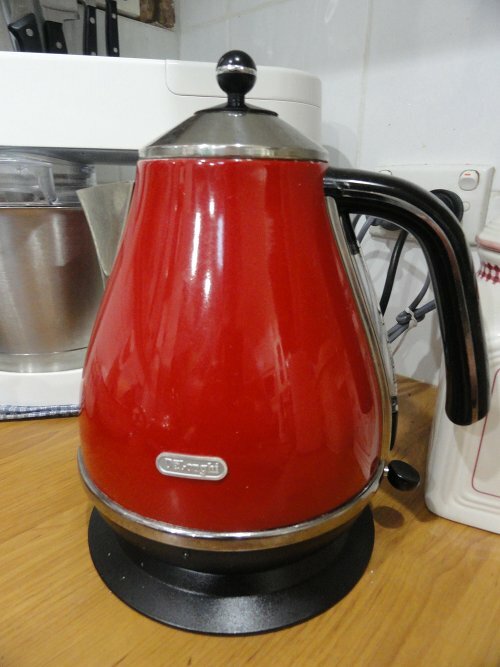 Electric kettle - If you're a tea or coffee drinker, you might like to invest in a kettle that will quickly heat water for your hot drinks. An electric kettle is more efficient and faster than a stove top kettle. I prefer the old-fashioned appeal of the stove top but for energy efficiency, nothing beats a good quality electric kettle. Chest freezer - I save a lot of money buying in bulk. Here dry foods like flour and rice, or meat, fish and chicken is stored in the freezer. The meat, fish and chicken is stored until it's used, the dry goods are placed in the freezer for a couple of days when they're brought into the home to kill off any bugs or bug eggs that may be in the packs. I also use the freezer to store excess vegetables that I blanche and seal for later use. Refrigerator - If you can afford it, a good quality fridge is a good investment. The newer fridges are more efficient users of electricity so they'll save money in the long run. Slow cooker - I think these are essential, particularly if you live in a cold climate or if you work for a living. Heavy based sauce pans, and stockpot. If you're a jam and sauce maker, maybe a Maslin pan for the jam, relish and chutneys. Cast iron or ceramic frying pans and Dutch oven. I try not to use Teflon coated pans. Water bath processor/canner or pressure canner - if you've got a garden and intend to preserve a lot of your excess, one of these would be handy. However, if you only do small amounts, a large stock pot would make a good stand-in water bath processor. Dehydrator - if you intend to dry a lot of your food, go ahead, for small amounts it's better to do them outside in the sun or in a warm oven or microwave, if you have one. A microwave doesn't make my list. I have one that is now 12 years old. When it dies I won't replace it. Water filter fitted to the sink - if you can afford it, these are a good investment. We drink a lot of water here and without the filter I can sometimes smell the chemicals they use to purify our water. Having a good supply of sweet tasting water is a big encouragement to drink water rather than milk, soft drinks or juice. 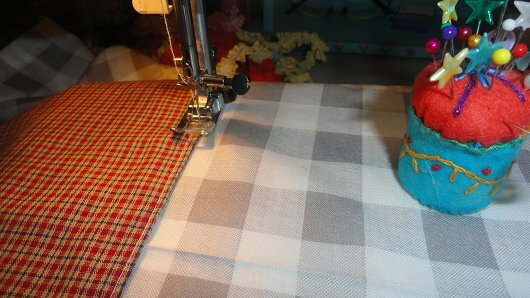 Sewing machine - I have a Janome Quilters Companion that I bought second-hand on eBay for less than half the new price. I've had it for about eight years now and never had a moment's problem with it. If you're a sewer, mender or have a small family, a sewing machine would probably serve you well. You don't have to buy the top of the range, just a good quality second hand one that is in good condition should do. And that's it. I know there are yoghurt makers, pie makers, cup cake makers and a hundred other appliances but I think if you have the essentials, it helps you get through the heavier work load of simple living without stepping over the line of too much. But we're all different, we all work according to our circumstances and I have no doubt some of you would see the list as too meagre and others too extravagant. Whatever you decide, buy the best quality and don't feel guilty for your choices. Guilt should play no part in this. If you're anything like me, you'll need some appliances to help you get through the sheer volume of work this way of living brings. But this is only my opinion - it's what works for me at this stage of life when I'm trying to cut back on power usage and purchases. What is essential in your home that isn't on my list? I am filled with unmitigated optimism at the moment because I have made some decisions lately, based solely on what I want to do. Selfish I know, but sometimes you just have to put yourself first. Behind me are a few months of exciting and memorable book promotions and years of enriching, life changing and sometimes demanding volunteer work at the neighbourhood centre. I have given up all my paid writing work. 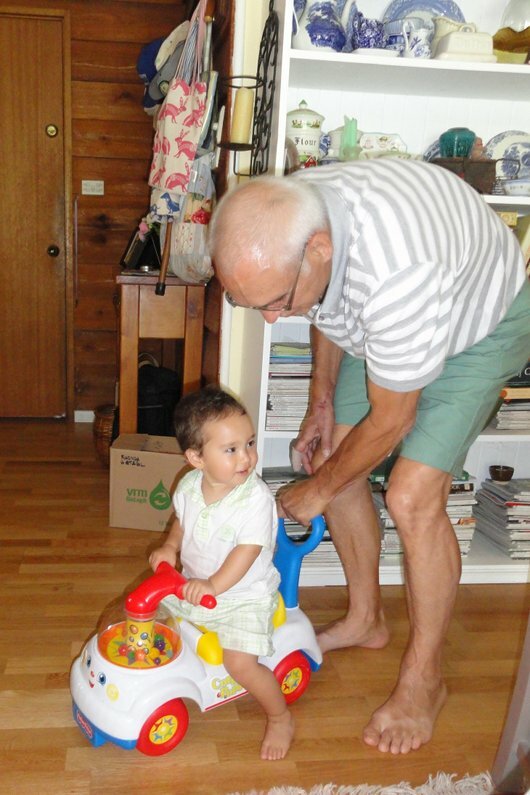 I have enjoyed all I'm leaving behind but home is where my heart is, I have grandchildren who need their grandma and opa at home and I want to develop different interests, write some more for you and be a homemaker again. 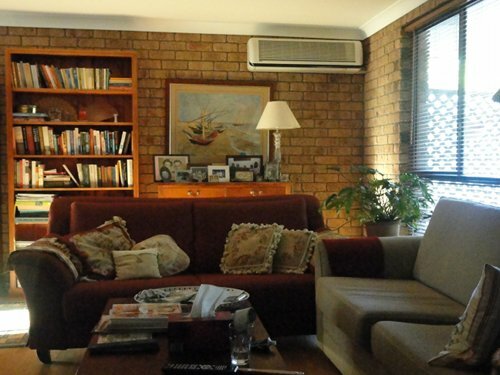 Late afternoon in the lounge room. To tell you the truth, I feel like I did when I first closed down my business and discovered the joys of domestic life. Then my friends queried my shift towards homemaking but I had discovered something precious they didn't know - it was an empowering and creative way to spend my time. What better project to work on than my life, in my own home? And that is where I am again but now it's not so much a major project, rather I'm modifying for older age and tweaking our home to better suit visits from grandchildren, family and friends. It's all ahead of me and I'm so ready to dive in. I want most of what I do now to come from my home and or be for my home. So what are my plans? Let's start with some good news. My book, Down to Earth, has gone into its second printing. I'm very proud of that because there were 12,000 copies printed in the first run and as my editor said, "that seemed so ambitious at the time", but they sold, in eight months. Penguin told me recently that an ebook version of Down to Earth will be out before Christmas. The ebook will not look the same as the paper book, otherwise the file would be too big to download but they're testing different formats at the moment and I'm hoping to have an update about it soon. By the way, the ebook is for sale only in Australia and New Zealand as Penguin doesn't own the copyright for any international sales. My New York agent, Abby, is currently at the bookfair in Germany and she has my book with her as part of their portfolio to promote this year. It's very exciting! But here at home, one of my projects will be to write some ebooks on particular topics to sell from the blog. They'll be well priced so anyone can buy then and they'll be sold both here in Australia and internationally. And I'm still going ahead with the blogging workshops with Ernie - the first one is scheduled next week, in Maleny. Later we'll do some more on the Sunshine Coast, Brisbane, the Gold Coast and possibly Toowoomba. 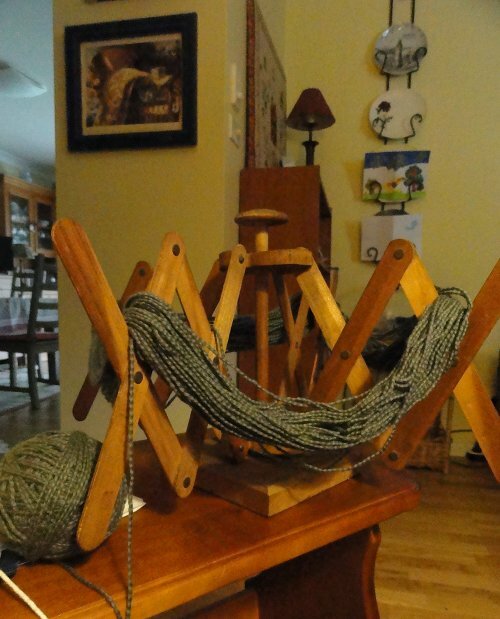 But even though all this will be going on, my main focus will be to remain grounded here at home - the writing will be woven into my days around the baking, cleaning, cooking, gardening, sewing, mending and knitting. This where I am at my best, nothing will change that. So if I nurture myself with home time, coupled with housework done to my old routines, I know I'll write well and do well when we go out for a workshop. The workshops will be fairly infrequent so most of my time will be here, at home, with Hanno, Hettie and the chooks, and occasional visits from family and friends. Some of Hanno's family are visiting from Germany next month and they'll be staying with us. There will be a long road trip while they're here but I'll stay at home to keep everything going and will really enjoy the solitude. 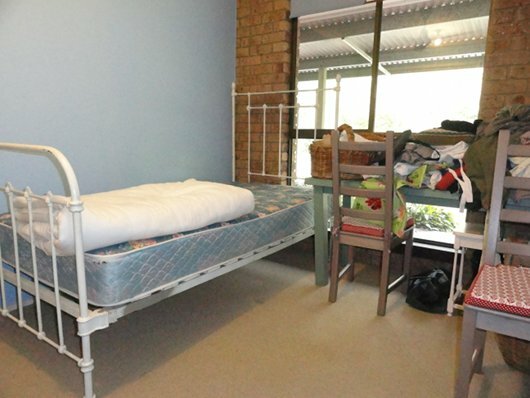 Before they arrive, we have an ironing room to turn back into a bedroom and about three weeks ironing to do. Maybe that's an exaggeration, it's probably more like four hours. Winding a shank of cotton into a ball. I have to get Hanno to look at this winder, it's not extending out as it should. Ahead of me right now - today - I have housework to do. In the coming weeks, we have to declutter again, I have the major task of reorganising my work room and there is sewing and knitting waiting. I want to make a couple of nightgowns for myself and a quilt for the bedroom we're bringing back to life. I have a cardigan for Jo's baby waiting to be finished and some vests and cardigans for Daniel and Laura's baby to start. 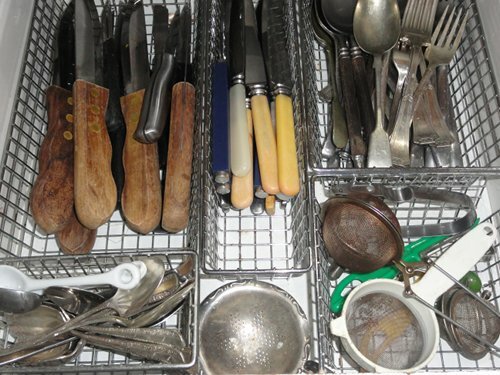 Before and after of the cutlery drawer. There is so much to do! Domestic life is opening up its warm and loving arms to me again and now I have the time to make the most of that. 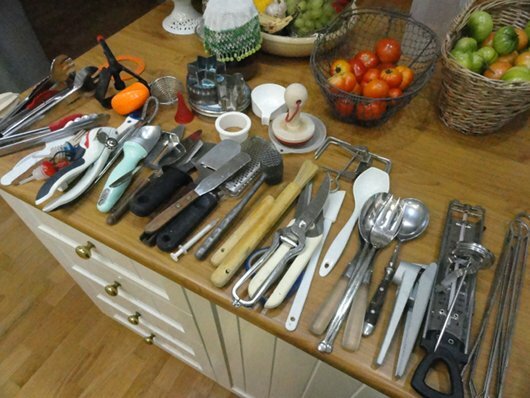 I am even going to clean out my gadget junk drawer in the kitchen. 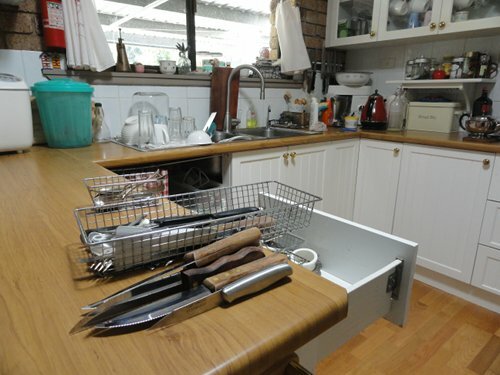 :- ) I might make a challenge out of that task because I know you have a drawer just like mine lurking in your home too. We'll do that together next week sometime. Today I'll be making bread, ironing, writing content for our blogging workshop website and finishing off our logo. What will you be doing today?